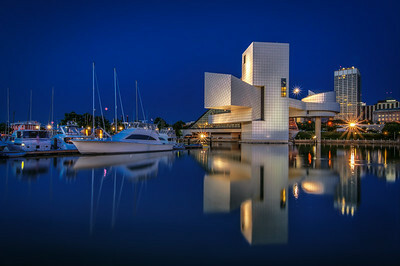 Despite shoting here probably a dozen times I never get tired of shooting the Rock and Roll Hall of Fame on the North Coast Harbor in Cleveland, OH. 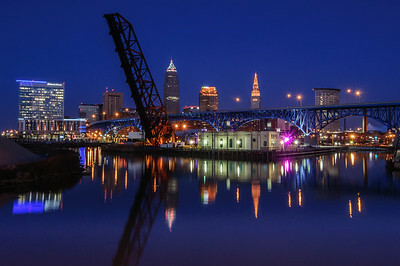 Taken during twilight at the North Coast Harbor in Cleveland< Ohio. 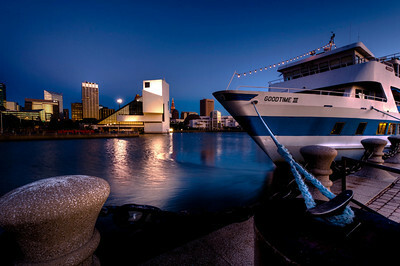 The harbor is the setting for the Rock and Roll Hall of Fame. 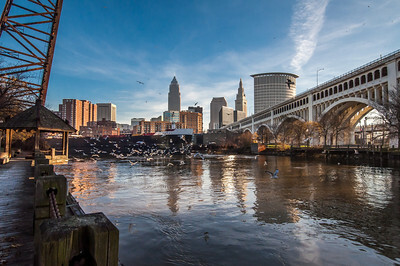 Evening falls on the city of Cleveland at the mouth of the Cuyahoga River as it enters Lake Erie. 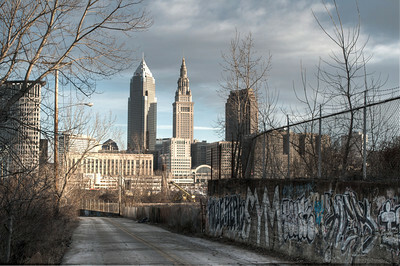 One of my favorite things about the city are all of the places where the industrial side of the city are still present. It is very evident here that the city is still a very important port in the Great Lakes. 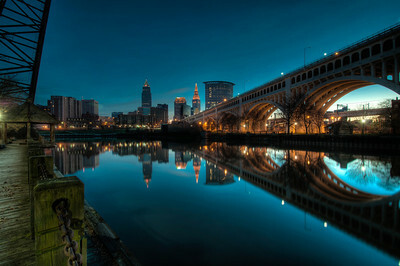 The skyline of the city of Cleveland, the Main Avenue Bridge and the Flats as reflected in the Cuyahoga River taken at twilight. 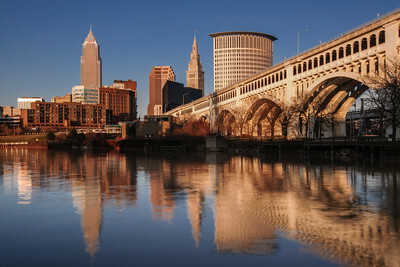 Thy skyline of Cleveland, Ohio and the Hope Memorial Bridge along the Cuyahoga River during the golden hour. 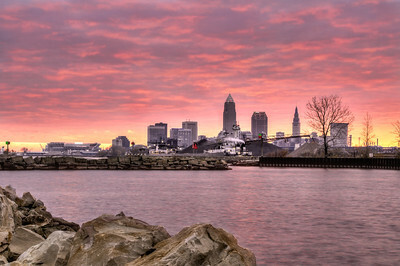 The city of Cleveland, Ohio as taken from the breakwall at Edgewater Park. 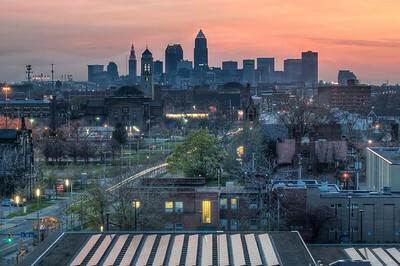 The skyline of the City of Cleveland along with a lit up Progressive Field taken from the Tremont neighborhood in Cleveland, Ohio. The Innerbelt Bridge and the industrial valley are in the foreground. 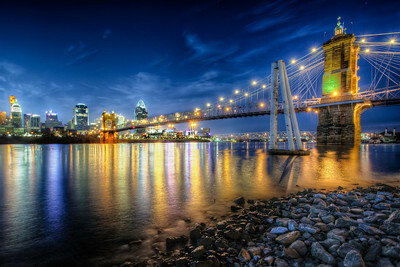 The skyline of the city of Cincinnati, Ohio as taken from the bank of the Ohio River in Kentucky. The city of Cincinnati and the John A. Roebling Suspension Bridge as seen from the banks of the Ohio River at night. 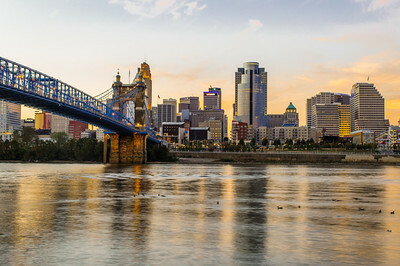 A panorama of the skyline of the city of Cincinnati, Ohio as seen from the bank of the Ohio River in Kentucky. The city of Cincinnati and the John A. Roebling Suspension Bridge as seen fro the banks of the Ohio River. The city of Cincinnati and the John A. Roebling Suspension Bridge as seen from the banks of the Ohio River. 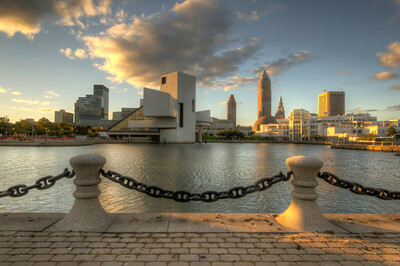 I have always visited North Coast Harbor in Cleveland, OH in the evening. It is one of my favorite places. The color of the harbor at night is extraordinary. I had never taken the time to visit in the morning. It was exciting because it seemed like a totally different place seeing it in the warm light of early morning. 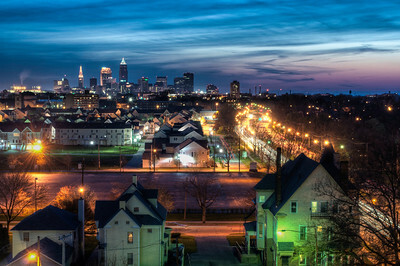 This has always been one of my favorite spots to view the city of Cleveland, Ohio. One of the things I love about the city is the industrial nature of it. 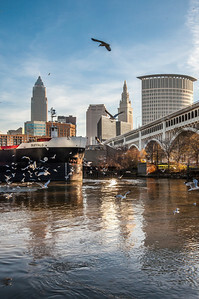 Nothing shows that better than the views from the Cuyahoga River with all of its bridges. 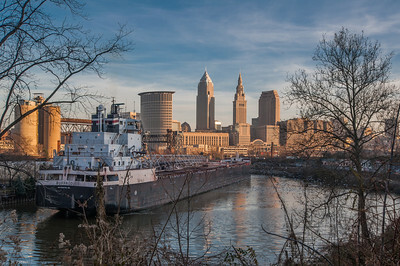 I was taking photos of the skyline in downtown Cleveland when a freighter came down the Cuyahoga River headed out towards Lake Erie. I had a lot of fun following it down the river. 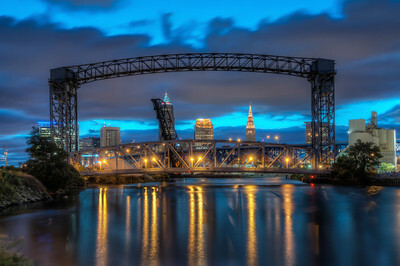 The skyline of the city of Cleveland, Ohio and the Veterans Memorial Bridge reflected in the Cuyahoga River. 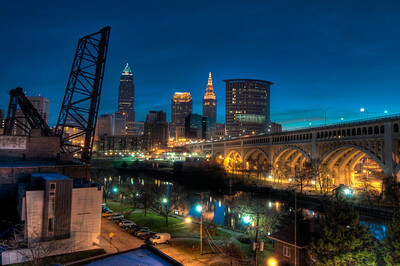 The skyline of the city of Cleveland, Ohio and the Veterans Memorial Bridge overlooking the Cuyahoga River. 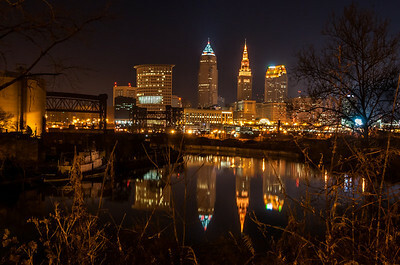 The lighted skyline of Cleveland, Ohio as reflected in the Cuyahoga River. 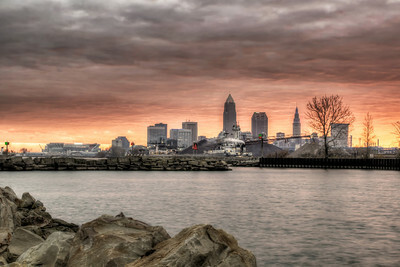 Taken at the North Coast Harbor in Cleveland, Ohio. The Goodtime III is done for the day. 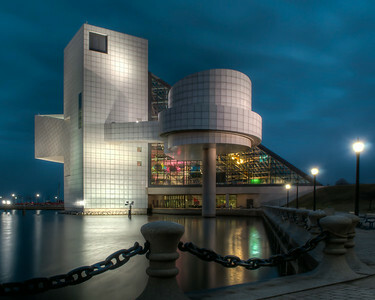 The Rock and Roll Hall of Fame on the North Coast Harbor in Cleveland, Ohio. I never tire of photographing this building. Every time I am here I find a new way to capture this building. 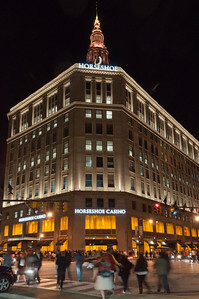 Horseshoe Casino from Prospect Ave. 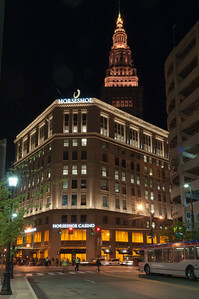 The first casino in the state of Ohio on opening night. The atomosphere was very exciting as the crowd begins to filter in to the Horseshoe Casino in Cleveland, Ohio for the first. The opening of the casino is a first for the state of Ohio. 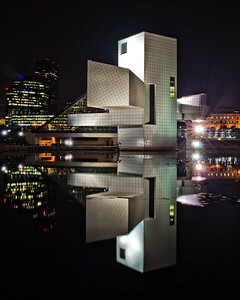 The Rock and Roll Hall of Fame and Museum in Cleveland Ohio at night. Again this is one of my favorite buildings. This time as taken from the front. Any city is really a sum of its neighborgoods. 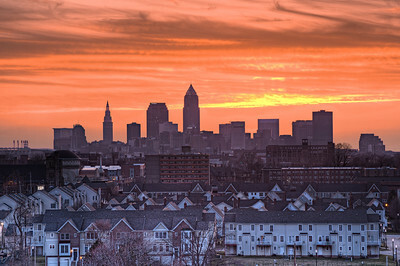 And the City of Cleveland is no exception. 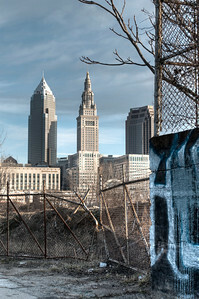 Taken from the Scranton Peninsula overlooking the Cleveland skyline. 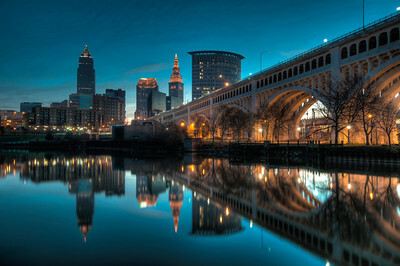 This is the skyline of Cleveland, Ohio as taken from across the Cuyahoga River. I love the area of the city where the industrial sections meet the downtown business area. It is the industrial past of the city that is exhibited by the old factories, warehouses and bridges that give the city its character. 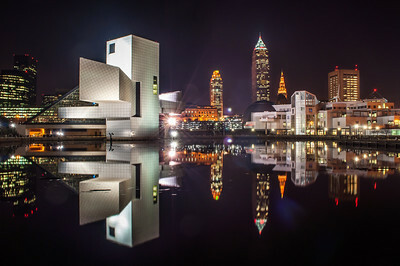 The North Coast Harbor in Cleveland, Ohio is another great location to capture a reflection of the city skyline if the weather is right. 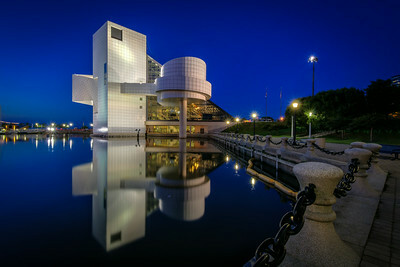 This is another of my favorite locations featuring my favorite building, the Rock and Roll Hall of Fame. 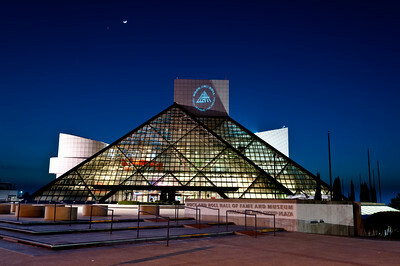 Another shot of the Rock and Roll Hall of Fame at Cleveland's North Coast Harbor. I got lucky on this night and had a windless evening. The water in the harbor was as calm as I have ever seen lending itself to nice reflections. 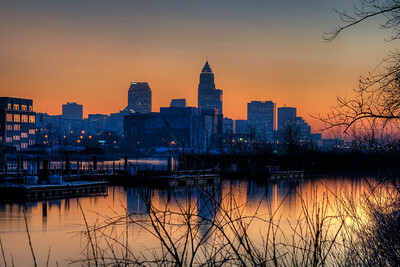 The Cleveland skyline at dusk as taken from the breakwall on Lake Erie. Once again dusk is easily my favorite time of day. After the sun sets the earth is enveloped in beautiful blue and purple hues while the sky is aglow with the last remnants of the sun's rays. It is a glorious time of day. 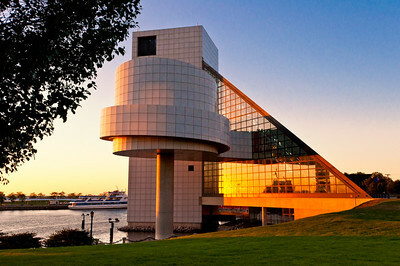 Located at North Coast Harbor in Cleveland, Ohio the Rock and Roll Hall of Fame is truly and architectural work of art by I.M Pei.